The Slide object as it appears in the Toolbox. The Slide object is used to present multiple visual stimuli (e.g., text, multiple images, text and images, buttons, sliders, etc. ), or combinations of text, images, and sound concurrently. The Slide object holds a collection of SlideState objects, which are used to organize the presentation of stimuli. Individual stimuli composing a single presentation event are entered on SlideStates using sub-objects. This hierarchy of objects permits tremendous flexibility in the presentation of stimuli. Properties are set independently for the Slide object, each of its child SlideState objects, and their sub-objects. The parent object (i.e., Slide) maintains parameters relevant to the duration of the object, the collection of input, and termination conditions. 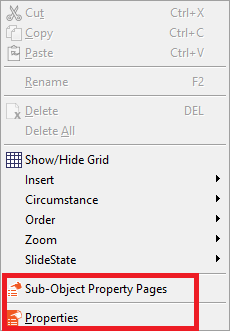 A new Slide object may be created by clicking the Slide icon in the Toolbox, and dragging the object to the Workspace. For existing Slide objects, clicking the object once with the mouse in the Structure view to select it will result in the display of that object’s properties in the Properties window. 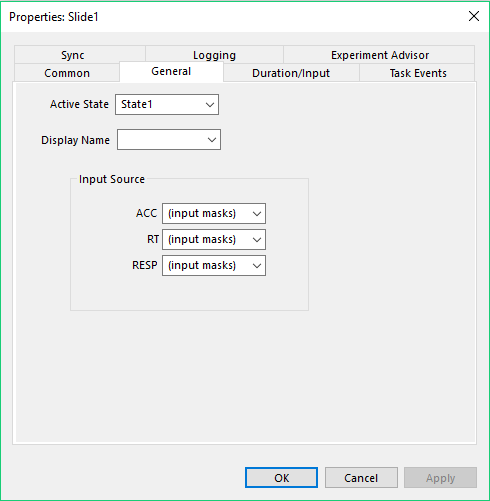 Double clicking an existing Slide object in the Structure view will open the Slide in the Workspace, and the properties for that object will be displayed in the Properties window. A Slide object opened in the Workspace displays the name of the object and the Slide object icon in the title bar at the top of the object window. Below the title bar, the toolbar lists the tool buttons associated with the Slide object. The SlideText button allows the placement of a SlideText sub-object on the Slide object to define an area in which to display text. The SlideImage button allows the placement of a SlideImage sub-object on the Slide to define an area in which to display an image. The SlideMovie button allows the placement of a SlideMovie sub-object on the Slide to define an area in which to display a movie. The SlideButton button allows the placement of a SlideButton sub-object on the Slide. The SlideChoice button allows the placement of a SlideChoice sub-object on the Slide. The SlideSlider button allows the placement of a SlideSlider sub-object on the Slide. The SlideSoundOut button allows the placement of a SlideSoundOut sub-object on the Slide in which to present an audio file. The SlideSoundIn button allows the placement of a SlideSoundIn sub-object on the Slide in which to record an audio file. The Add SlideState button permits the addition of a SlideState object to the collection. The Remove SlideState button removes the selected SlideState object from the collection. The Clone SlideState button copies the selected SlideState object and creates a new SlideState that is a copy of the original. The Bring To Front button places the selected sub-object in the foreground if several sub- objects are overlapping. The Send To Back button sends the selected sub-object to the background if several sub- objects are overlapping. 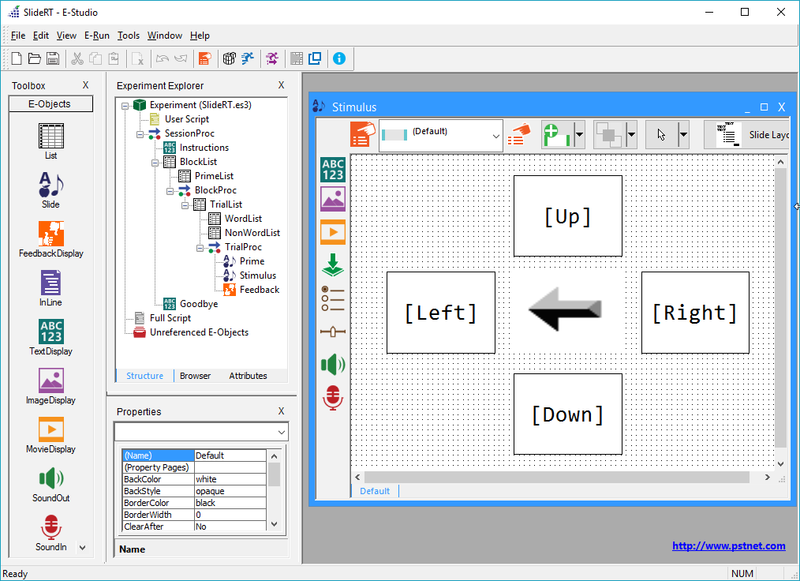 The Select Objects button activates the cursor so that specific sub-objects may be selected. When selected, the borders of the selected objects are defined by Windows resizing handles. The Zoom In button allows the user to zoom in on a selected portion of the Slide object. The Zoom Out button allows the user to zoom out on a selected portion of the Slide object. The Grid button toggles the display of the grid in the object’s display area. Allows selection of a specific item (i.e., the parent Slide object, SlideState, or sub-object). Allows the selection of a template for SlideButtons, SlideSliders, and SlideChoice. The Properties button displays the Property pages for the display area of the Slide object, or the selected sub-object. The Sub-Object Property Pages button displays the Property pages for a selected sub-object (i.e. SlideImage, SlideSlider, etc.). NOTE: The Ctrl+Alt+Enter keyboard shortcut allows users to open a selected Sub-Object's properties. The display area appearing at the bottom of the Slide object window is used to enter and organize the text and images to be displayed at runtime. The display area is, itself, a SlideState object. By default, a new Slide object is created with a single SlideState object. Additional SlideState objects may be added. The Slide object is the parent to the collection of SlideState objects. 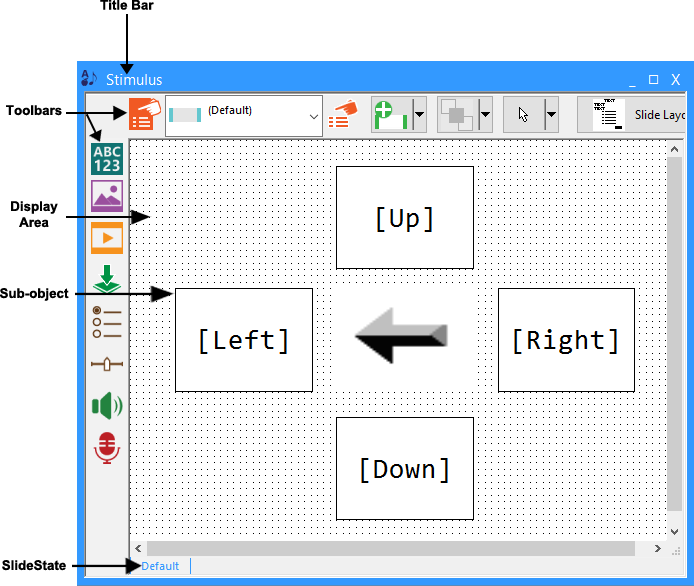 In turn, a SlideState object is the parent to a collection of SlideStim objects, also called sub-objects, which are used to enter a single text, image, or sound stimulus. Combinations of sub-objects compose the structure of the SlideState. Multiple SlideState objects allow the customization of varying stimuli to be presented by the same parent object. Refer to E-STUDIO: SlideState Object  for a complete description of SlideState objects. Refer to E-STUDIO: SlideButton Sub-Object , E-STUDIO: SlideChoice Sub-Object , and E-STUDIO: SlideSlider Sub-object  for more information on buttons. The properties for the Slide object may be set using the Property pages. The Property pages may be displayed using the Property Pages tool button on the Slide object toolbar. The General tab displays the ActiveState, indicating the SlideState object to be displayed when the Run method is called for the parent object. The value for ActiveState may be the name of a specific SlideState, or may be an attribute reference, in order to vary the SlideState presentation (e.g., per condition). Additionally, optinons for the Display and Input Source are specified here. ActiveState String values representing names of SlideState objects, Attribute references Identifies the SlideState to be displayed when Run is called for the Slide object. Specifies which Display device the movie should be presented on (when using multiple monitors). Input Source ACC (input masks), SlideSliders, or SlideChoice sub-objects Determines what component (i.e. input masks, SlideSlider, SlideChoice) the Slide ACC is derived from. Input Source RT (input masks), SlideSliders, or SlideChoice sub-objects Determines what component (i.e. input masks, SlideSlider, SlideChoice) the Slide RT is derived from. Input Source RESP (input masks), SlideSliders, or SlideChoice sub-objects Determines what component (i.e. input masks, SlideSlider, SlideChoice) the Slide RESP is derived from. The Properties for the Slide object may be set using the fields in the Properties window. Properties include information concerning the observable features of the Slide (e.g., BackColor). (Name) String values Assigns a user-entered string as the name of the Slide. (About) --------- Displays the About Slide dialog. (Property Pages) --------- Reveals the property page interface to specify the properties for the selected object. Enabled Yes, No Represents whether the object is enabled or disabled. The main difference between these two buttons in that the Property Pages button opens a Slide's properties. For example, this is where Duration and Input Masks are decided. The Sub-Objects Property Pages button opens a selected sub object's properties. Properties can be accessed for the sub-objects listed in the following article: E-STUDIO: Sub-Objects . For example, the Sub-Objects Property Pages button allows users to specify text on a SlideButton or a Filename of a SlideImage. Both the Properties and Sub-Object Properties can be selected using the right click context menus.